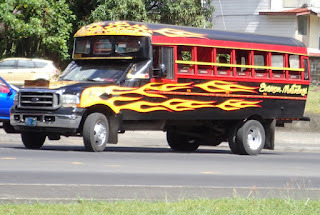 How you not love a bus with flames painted on the outside? 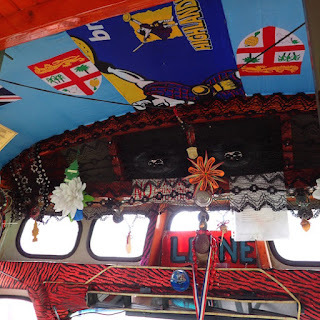 No two buses are painted alike in American Samoa. their personality in the choice of decor. Part of what we love about sailing is seeing the world while casting a smaller environmental footprint. We mostly sail under wind power, and rarely start our engine outside of entering and leaving anchorages. When ashore, most of the time we walk. Once in a while we bicycle and when local mass transit's an option, we're thrilled. It's usually quite inexpensive and gives us a much better taste of what it's like to do more than just pass through. St Lucia offered our first taste of a different, private entrepreneurial approach to mass transit (click this link for more about that). Cuba certainly takes the prize for the greatest and quirkiest variety of transportation (click this link for photos). 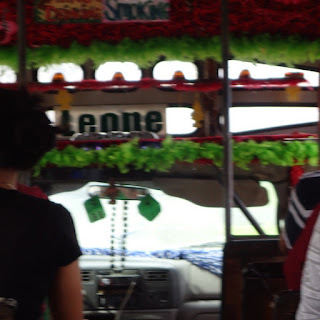 This cruising season, we took the bus some in Panama but never quite felt like we got the hang of it. inside some of the buses. Since then, most of the time it just wasn't a viable option, if it was an option at all... until we got to American Samoa. Here the local buses feel like a semi-open air school bus. Called aiga (family buses) they're privately owned and operated. Far from the homogenized buses, each bus reflects the personality of its owner. Most are blaring the driver's favorite tunes, though I saw a high schooler stick his usb-based music selection into the driver's stereo, with the driver's blessing. While I've heard about TVs on buses, out of 20+ rides so far, only one had a TV on board. 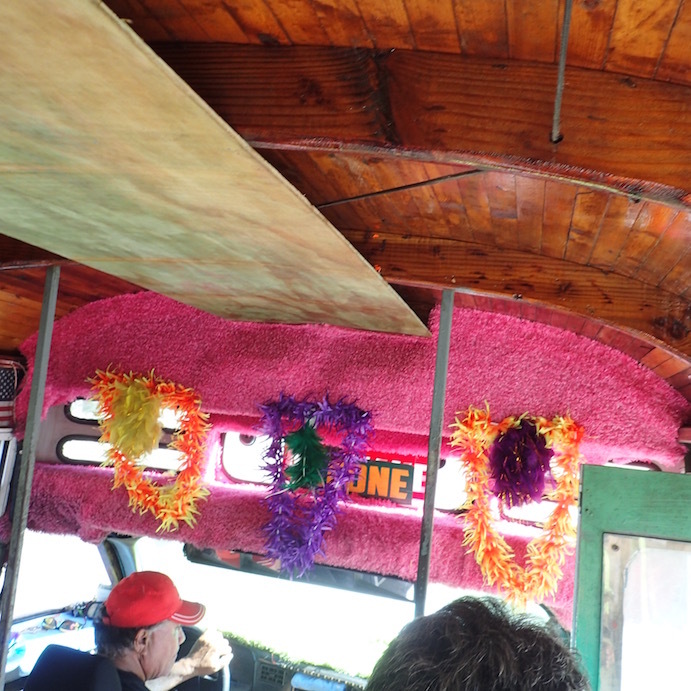 It was playing a local station, with what looked like a slapstick show of sorts, in Samoan. 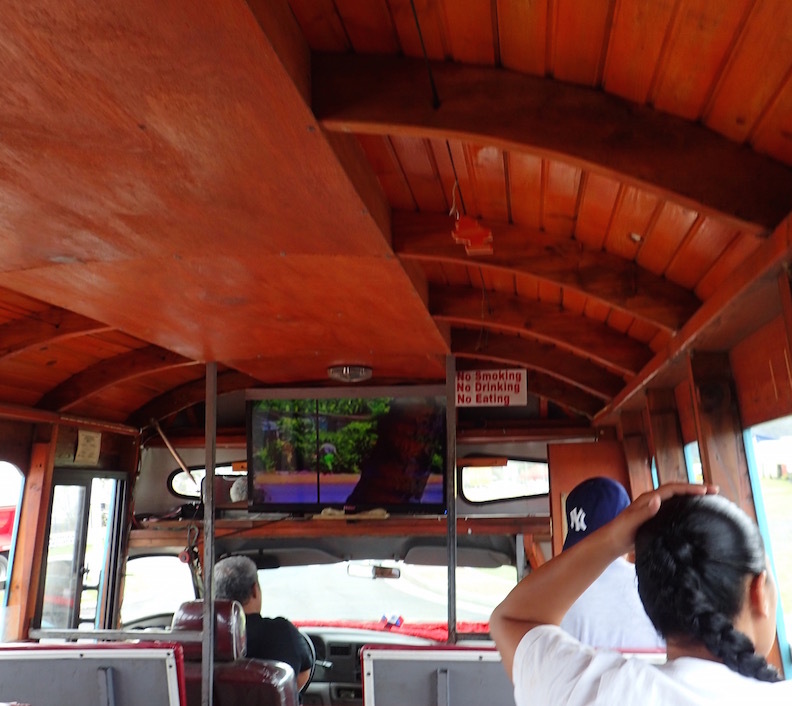 The only American Samoa bus I've ridden (so far) with a TV. 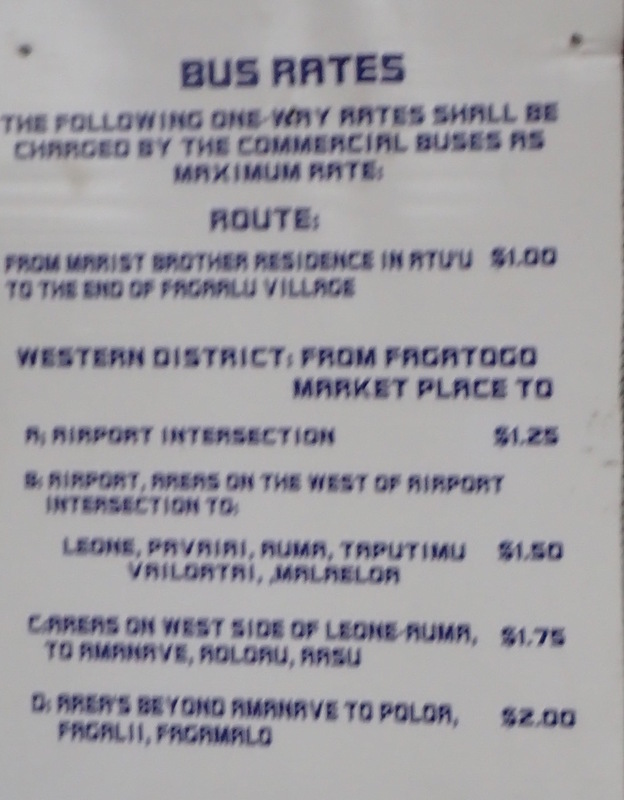 Getting to most places in American Samoa costs $1; sometimes less, but not more than $2.50 one way. There's one main road that goes through the island, and several side roads that are part of the official or unofficial route. Sometimes the buses are empty, other times they are quite crowded, especially when school lets out (mid-afternoon) and around quitting time (Monday - Friday at about 4 pm). The buses are done running sometime between 5 and 6:30 pm. They don't run at all on Sundays. Not sure what time they start, as I confess to not being an early bird on American Samoa when it comes to getting off the boat. The buses travel along a predefined route -- mostly, but may deviate from it, typically for regular customers. You are unlikely to find a formal map or schedule anywhere, though it doesn't take too long to figure out which bus to take where, especially if you have a map and know what town you need to go to. 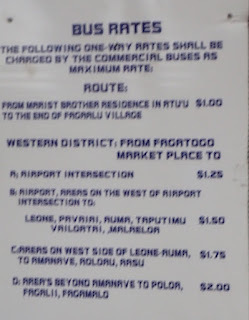 Usually locals and drivers are willing to help out, especially if you're looking for a well-known destination like Cost-U-Less and KS Market or Laufou Center (Carl's Jr., Blue Sky phones, etc., across the street from a True Value hardware store) From Pago Pago harbor, Tafuna will generally be cruisers' go-to bus line, sometimes Leone, with a lap that overlaps a part of the Tafuna route but passes by Ace Hardware. colors, textures, patterns and objects. The most reliable places to catch buses are at bus shelters (covered and with a bench), or a bus sized bump between the road and the sidewalk. There are also a number of stops buses make to pick up and drop off passengers that are not marked. Whether at a bus shelter or a potential bus stop, buses are flagged by placing your arm in front of you and toward the street, hand out straight, palm down. Sometimes it's hard to read the bus route to tell if it's the wrong bus until they've already pulled in to pick you up. A head shake generally is the fastest way to flag the driver you made a mistake and are waiting for another bus. 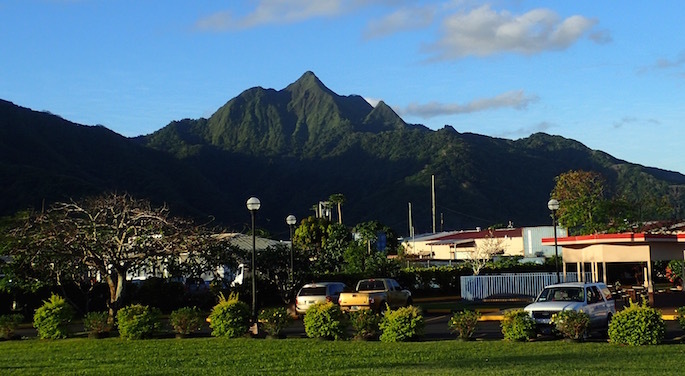 Given the stateside inclination toward more formalized mass transit with maps and published, scheduled routes, and the risks to drivers given the litigiousness in general in the US, it's hard to imagine a system like the one in American Samoa working. That's the US' loss. There's a certain rough charm to American Samoa's system, and it helps provide cheap transportation while dramatically reducing the number of cars required and on the road. Best of all, it's a good opportunity to spend more time with the people who live here, observe and sometimes make conversation. After all, that's part of why we travel, not just to hang out others a bit too much like ourselves. Mountain view near American Samoa airport, taken from the bus. We're currently anchored in Pago Pago, American Samoa (S14.16.472 W170.40.456). We opted to skip our first potential weather window to Tonga,our next stop. In part we chose to spend more time exploring American Samoa as a place to live and work for a while when we're done sailing.